There is an old adage that an army marches on its stomach, and by 1914 the British Army realised that to fight even a short war in Europe it would have to provide the required infrastructure to feed it’s troops on campaign. Much of this work was done by the Army Service Corps (ASC) and one of it’s key units in providing part of the staple diet was the Field Bakery. In 1914 there was one Field Bakery in every infantry division. Staffed by one officer and ninety-two men from the ASC it could produce enough bread for more than 20,000 men. Because of the nature of their work they did not set up these bakeries near the front, and many in 1914/15 were based in locations like Rouen and Abbeville, and a little nearer the front in St Omer and Hazebrouck. They tended to be static units that did not move around much. 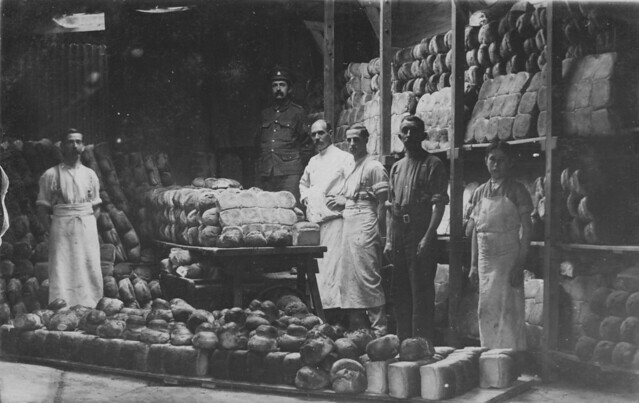 This image shows the inside of a Field Bakery in France in 1914/15. A Non Commissioned Officer from the ASC is in the background overseeing the work and the men are in work aprons sorting and stacking the loaves so they can then be sent off to the troops at the front. Who the young lad at the front is, is something of a mystery; while there were many boy soldiers this one looks especially young; perhaps he was a local helping out? This entry was posted on 05/09/2012 by sommecourt. It was filed under Behind The Lines, British Army, France, Great War, Western Front, WW1 and was tagged with 1914, army service corps, Bread, Field Bakery, Rations, Rouen. That’s a really interesting post Paul and a wonderful picture. ! I have to say the bread looks quite good. Thanks Gen – yes, it does look good! Fantastic picture. Never seen anything like this before and I agree, the bread looks rather delicious. My Great Grandfather Gardner Hogg was a private in a ASC bakery unit from march 1915 (his older brother James Hogg had just been killed in January of 1915 serving with the 2nd Devonshire regiment). Gardner was cumpulsary transferred to the KRRC in 1917 and later suffered gas poisioning. He served 8 months in the Dandelles too! God rest them both. My great grandad’s father was a baker from Nottingham. In 1916 he was a private in the 11th Field Bakery ASC, initially stationed in Boulogne sur Mer, France by the looks of it. In July 1916 he was in the 20th Field Bakery ASC. I don’t know much more, but is there anywhere to keep up to date with your book progression? Hi Janet, My great great grandfather was in the 5th Field Bakery, I would love to learn more about everything that went on. If anyone has more photos of bread, bakers, boulangeries etc during WWI I would be pleased to see them as I am helping a boulanger in France with a ‘Bread in WWI’ exposition over the centenary years. Of particular interest are photos involving Australians and bread, or anything in Corbie, France. My Great Uncle, Raymond McLeod Murray, was a Sergeant in the 19th A.A.S.C 2nd Field Bakery. I have copies of all the war diaries kept by the unit and they make very interesting reading. They are available in PDF format through the Australian War Memorial. I would be very interested to learn more information should anyone know. My great uncle Albert Alexander Lloyd served in the 52nd Field Bakery, ASC. He died on 15 December 1915 and is buried at St Sever Cemetery, Rouen. I would really like a photo and more information about the Rouen bakery which would be very welcome for our family history book we are putting together, for our children and grandchildren. He was 37 when he died. He was a private, service number S2,SR/03323. Wonderful to know about your great uncle I shall put him with the information I have collected. I have lots of information which I am putting together into a book and hope to be able to tell of the amazing work these unsung heroes performed. The sheer scale of the number of loaves they produced 6 days a week, week in week out is quite staggering, flour shortages, air raids, exploding ovens and still the troops were fed. That’s fantastic that you are researching these young men who fed the troops. It would have been a horrendous schedule to keep up with, given the setbacks they had. Good luck with your book and if I can unearth anything else which I think will be of use to you I will contact you. All the very best. Dear Janet, Please let us know when your book is available. Would really love a copy. My great grandfather was here. I am putting together as much information as I can. By the second part of the war it was the largest bakery in the world! It was constantly subject to air raids. The regime was relentless 24 hours a day 6 days a week. The men got to breaking point and threatened to strike! It’s taken me 2 years so far, I’ve just looking a few more original sources before drawing it all together. My grandfather Pte. Frank Langton (a baker by trade) was in the 23rd Field Bakery in July 1917. I do have a photo of 14 guys and dog outside the hut. Just putting together all my research so hopefully have something to put out next year. It has been almost 3 years of research! Would you be willing to share your photograph? So happy to find a site that has details of field bakeries. My grandfather was in the 3rd field bakery 23rd battalion (Australia) 15th reinforcement based in Rouen and was there from 1916 to 1919. I have only records of his comings and goings (leave, sickness, etc.) but not much information on what was happening on site. He was CO from 17/3/1917. I’ll add him to the list of bakers I have found. My great grandfather was staff Sgt in charge of one of the bakeries at Rouen and was awarded the DCM. I have uncovered lots of information which I am putting together will hopefully be able to publish. Hello Janet. My grandfather from Norfolk was in 25th Field Bakery. W J Regester, born 1866. I have just found that out today and would love to know where they were stationed or anything at all about 25th FB. If you have any info. at all about them I would be really interested. I’ll add your grandfather to my list. I’ve spent almost 3 years researching. Very few diaries survive and quite a number are just logs of numbers of loaves baked! I am attempting to put together a book? Fingers crossed and I’ll keep you posted. Hi I have very little information, as no war diary has survived for the 5th. I am in the process of trying to map the various bakeries and piece together what life would have been like for them based on my research. If you let me have your grandfather’s name I can add him to my growing list. At some point I may even be able to give you details of other bakers who may have served with him. It is a gigantic jigsaw with quite a few pieces missing and I’m nearly there. Hope to hear from you. Thank you for this information. I will add Thomas Woodward Green to my list of bakers. Was this bakery section a British or US bakery section? It would wonderful to see a photograph of the kit you have, would this be possible? My husband’s father, Victor N. Gregory, was a baker with the 348th Bakery Company in France. I have letters from him from boot camp and from France. Also, have a long picture of the bakers at his boot camp in Camp Kearny in California.